The gateway to Durham via its raison d'etre - the railroad line - for 60 years; this proud piece of architecture, symbolizing Durham's aspirations as a city of the new south when built in 1905, was demolished to extend a street and build a parking deck in September 1968. I really enjoyed your post on Union Station...and as always, great photos. FANTASTIC post! You're correct--the City has itself to blame for the fact that we don't have a decent train station. Thank you both so much. I am, of course, indebted to others for taking all of the old photos. But hey, maybe in 50 years somebody will be able to use all of my ancient 2007 photos. As one who loves old architecture so much, I feel almost sacreligious sometimes driving on Ramseur St. over this spot - sort of dancing on the grave of Union Station with a car, the seed of its demise. "Self-satisfied conviction?" How about that a majority of people would really rather live in apartments or condos in a city than in a detached house in the suburbs with their own backyard. Also, the genesis of the interstates was the millions of troops who'd seen the autobahns in Germany and wanted the same thing in America. Not a "Red Scare". You may be right, although what I mean by "self-satisfied conviction" is our perception of the benefit, not our perception of people's motivation. I'll concede that many tout the benefits of a denser environment (including me) when we don't know where that curve may lead. I think the difference is in trying to be wary of the unforseen consequences rather than convinced of eventual utopia. You've misinterpreted my statement about "Red Scare". What I stated was that it influenced the passage of the bill, not that it was the primary reason people wanted the roads. The bill was clearly written with justification of troop movement in a cold war/nuclear threat atmosphere as a central component. I'm not sure if the NS made use of the Union Station, but one would assume so. Durham also had streetcars too for a time, under the names of The Durham Street Railway Company (1885) and then later as the Durham Traction Company (1900). These were gone by 1930, replaced by buses. More information about the railroads of Durham can be found in an article called "Railroads of Durham" by Tony Reevy in Railfan & Railroad's May 1995 issue. Thanks Rob. To my knowledge, the Norfolk Southern never served Union Station. You can read a bit more about the streetcars in Durham here. Gary, your blog is the best info I've ever seen on the Durham Union Station. Richard Prince's 1972 book on the Norfolk Southern states that the NS did use Union Station. The book has a 1923 timetable that shows a five hour (!) schedule between Durham and Duncan NC where the Durham branch connected to the NS main line. To reach Union Station the NS would have used about 3 miles of trackage rights it had over the Durham & Southern. The Norfolk Southern ceased passenger operations in 1948. Durham came fairly close to having a sixth railroad serve it. The Atlantic Coast Line RR was building west from Rocky Mount NC heading for Durham, getting as far as the quarry east of Rolesville NC before giving up. Many thanks - I'd never seen a Norfolk Southern reference vis a vis union station - but I actually missed in Rob's earlier comment "via trackage rights..." Thank you very much for the clarification - trains are not my historical forte! Really enjoying reading your posts about RR history in Durham. There is far more of it than I ever expected, which is a very nice surprise for a train buff like myself. It's great to see all these old pictures you've got on this site, thanks for all the effort! Thanks for the compliment - Durham's history and train history are so integral to one another, I should have even more. But I'm glad there was enough here for a pleasant surprise. 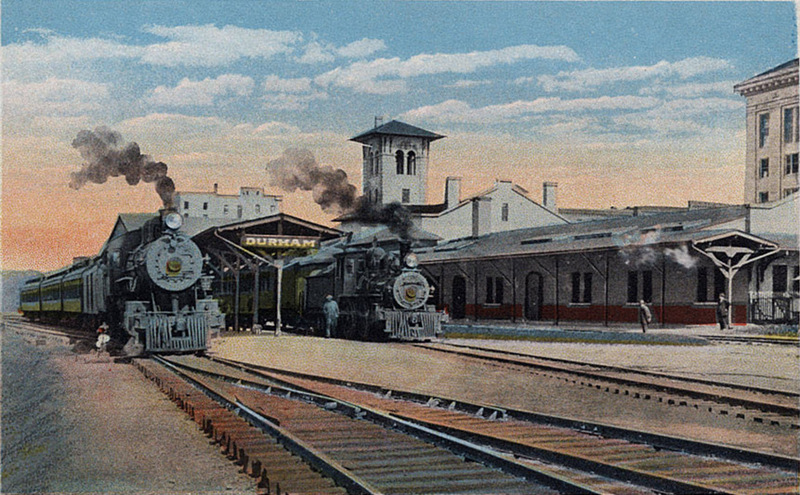 The last regular passenger train to serve the Union Station left Durham on March 16, 1964. By that time, the waiting room usually appeared just as it did in the photo, with no passengers in evidence. Thanks for a wonderful blog. It is sad that an area that owes so much to the railroads and once boasted at least 10 train stations now only has one left. Thanks to the residents of Rougemont (northern Durham County) for their attempts to save this last remaining piece of our history (www.saverougemontdepot.org). There was no Norfolk and Southern RR that I know of until 1982, when Southern RR and Norfolk and Western combined. In thinking back, wouldn't the Union Station have been a grand place for a Durham history museum? But no one thought that way then --- and probably not now either. Are there other sites/buildings that someone would suggest. Just wondering what others might offer. Well, some people thought that way, as when the Southgate Jones family offered to donate their house to the city for a history museum back in the 1940s. The city turned it down. But the city's leading lights have never shone very brightly on this sort of thing, and they still don't. The various economic organizations + city + county still think the city's biggest priority is fostering new construction - of anything. They'll do it themselves if they have to. Economic viability / plan optional. As long as there are cranes and paving companies. Union Station would, perhaps unsurprisingly, have made a great train station. Figuring out how to integrate this + any future rail into the Walker warehouse / bus station site wouldn't have been an issue. Alternatively, it would have made just about a great anything else. (Office, retail area, etc.) Great buildings attract people - they always have. The cities that people talk about with great affection - the cities that people visit as tourists and spend money - are usually filled with great buildings. But the city and county still don't understand this. In my experience, they can only see the current use of a building. So if an operator is selling beer and smokes out of a great building, then the building is junk and should be torn down. If they are selling artisnal pizza, it's a great building. I developed this site and wrote all of these posts to try to help people understand the distinction. A good building is a good building, no matter what is in it right now, or how useful it is in the moment. That's a resource, on multiple levels, and we should value it. That's not to say that there aren't competing priorities at times that need to be integrated into decision-making as well, but I've never felt like the existing-building-as-resource idea sticks. So if you're building a parking lot for your behemoth new taxpayer-funded county building, it's completely okay to tear down a bunch of historic buildings because what is in them at the time are junky uses. At the end of the day, the most frustrating thing about living in Durham and caring about this kind of thing is that there seems to be no lessons learned. You fight the same battle over and over again. So no one in a decision-making capacity acknowledges that there may be similarities between decisions made in 1960 and decisions made now. Thank you for sharing this wonderful piece of history, brings back lots of memories. When Durham mayor Bill Bell reacted to the DOT's decision to pull back from plans to locate the Amtrak station in the Walker Warehouse, he said, per the Herald-Sun, that Durham was likely to end up the only city in North Carolina "that has a dumpy railroad station." If I were with the state, I would have retorted - "and whose fault is that?" Neck and neck with the Washington Duke Hotel for the most grievous single-structure architectural loss in Durham history is the demolition of Union Station, demolished by the City of Durham to make way for a road and a parking garage. 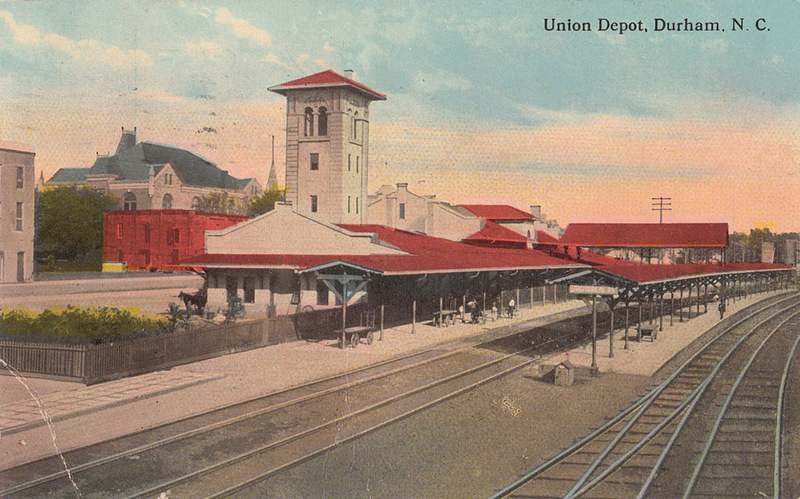 As with stations around the country with the same (or similar) name, Union station arose out of the need to consolidate several smaller stations, belonging to individual railroad companies, into a single terminal. In Durham, I believe there were three - Seabord, Norfolk-Western, and Southern - scattered along the rail line from Dillard St. to Corcoran. Looking west from the tracks, south of the courthouse. Union Station was constructed in 1905 for $50,000 by the above-named railroad companies at the foot of Church St. It was an Italian Renaissance revival structure designed by Milburn and Heister, responsible for many of Durham's early buildings. Rendering of the proposed station by Frank Milburn. Its most distinctive feature was a 65-foot tall tower. Above, looking east from the Hosiery Mills building, 1920s. Union Station is at the center and, immediately to its left, the courthouse (which people call the old courthouse, but given that we are about to build our fourth major courthouse, I'll call it the second.) The south-facing facades of East Main are at the extreme left (including the Malbourne Hotel) and the old JD Lyon tobacco company/city stables are immediately across the tracks (with a smidgen of the Venable Warehouse visible beyond it). Those who feel that Durham mistakenly located its current jail at the main entry points to downtown should realize that this is a long tradition. 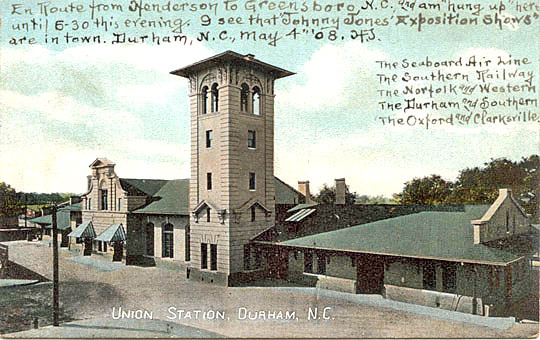 As Steve Massengill notes in his book, "Images of America: Durham"
"As a youngster in Durham, the compiler recalls the prisoners' jeering taunts from the open windows of the jail on the top floor [of the courthouse]"
Below, the station in 1924 with the train pulling out. The courthouse is to the right, and the warehouses along Peabody are visible just beyond the station. There was also a jail located in the small structure just behind the tower. But other than the greeting committee, it must have been a beautiful sight to step off the train, exit the station to the cobblestones of Church St. and Trinity Methodist Church as the terminating vista 3 blocks away. A view of the tower and the station, looking east, 1930. Below, looking west, a train pulling into Union Station, 1940, with the Durham Silk Hosiery Mill in the background. Below, the view of the front of the station from East Main St., looking down S. Church during a snowstorm in 1945. The old engines were replaced by the 1950s with the less-embellished modern engines. Below, looking northeast from the tracks towards the station. Below, the view east, 1950s. The station from the tracks, looking east, 1968. From the platform, looking northwest, 1968. By 1968, Durham had been busy implementing the Tarrant plan, including punching through a road from the West Chapel Hill St. railroad crossing along the formerly intermittent Peabody St. to connect with Roxboro and Ramseur- the southern portion of the downtown loop. At the same time, using Federal Urban Renewal funds, the city had taken and demolished a swath of structures along either side of the path of the Loop, and was building a series of parking garages on that land. 1968 was the year that plan hit Union Station. Looking northeast, September 03, 1968. And the Church St. parking deck was constructed on this land in 1978. And an addition was built behind the 'old' courthouse in the early 90s, with a similar red roof, on the eastern portion of the former station site. "Make no little plans; they have no magic to stir men’s blood and probably will themselves not be realized," said Daniel Burnham. While I'm a fan of Burnham and the Plan of Chicago, I consider plans that 'stir men's blood' with a skeptical eye. Because the thrust of this website is that a group of people once considered the demolition of Union Station, the Loop, the Freeway, Urban Renewal, etc. a great idea. We like to consider ourselves more enlightened, but then, so did they - convinced that no one would ever ride the train again. What is our self-satisfied conviction? Thanks for a wonderful blog.